Rich Franklin earned a chance to regain the middleweight title by defeating Yushin Okami in the main event of UFC 72. The show marked UFC’s debut in Northern Ireland and the third event in the United Kingdom, as UFC 38 and UFC 70 took place in England. Franklin won the first two rounds and held off a late charge from Okami to win 29-28 on all three scorecards. 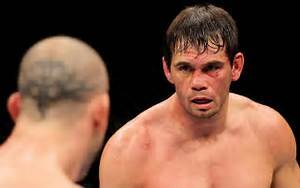 Forrest Griffin moved up the light heavyweight division rankings with a unanimous decision over Hector Ramirez. “I’m Irish, I’m in Ireland, I deserve a little luck,” said Griffin, who improved his record to 14-4. Jason “The Athlete” MacDonald pummeled Rory Singer with punches and elbows to score a TKO win in Round 2. In a lightweight bout, Tyson Griffin rebounded from his first career loss by defeating Clay “The Carpenter” Guida by split decision. Ed “Short Fuse” Herman won the PPV opener over Scott “Hands of Steel” Smith with a rear naked choke in Round 2. Marcus “The Irish Hand Grenade” Davis lived up to his name by knocking out Jason Tan in 75 seconds. In other pre-show bouts, Dustin Hazelett forced Steven Lynch to submit to an anaconda choke at the 2:50 mark; and Eddie Sanchez beat Colin Robinson by TKO in Round 2.